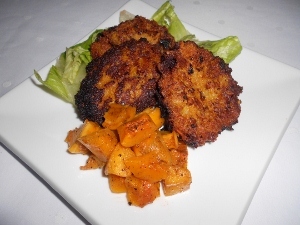 I was looking for a little twist on the traditional potato latke, and came across these unbelievable sweet potato latkes on cookingwithsugar.com. Before you scoff at the idea of apples in latkes, remember that we eat latkes with applesauce, so it’s not a foreign concept. These are really good!! Your family will love them!! 1. In a bowl, stir together potatoes, green onion, onion, apple, egg, salt, and pepper. Gradually add the pancake mix and stir to combine. 2. Heat oil in a deep skillet over moderate high heat until hot but not smoking. Working in batches of 4 or 5, spoon a large spoonful of the mixture into the oil and lightly flatten. 3. Reduce heat slightly and cook for about 2 minutes on each side or until golden brown. 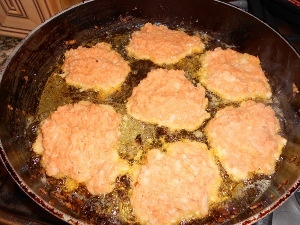 Transfer latkes with spatula to a plate layered with paper towels. If you’re not serving them immediately, warm them for a few minutes in the oven before serving.